The dust and gas around the star HD142527 observed by ALMA are shown in red and green, respectively, while near-infrared observations taken by the NAOJ Subaru Telescope are shown in blue. The dust is heavily concentrated in the northern (upper) part of the disk. Alien planets may be forming inside a giant gas ring located surprisingly far from its young parent star, scientists say. In fact, the planet-forming region is so far from its star — about five times the distance between our own sun and Neptune — that it appears to be the first time researchers have seen such an arrangement for the birth of alien planets. The powerful radio telescopes that make up ALMA offer astronomers a chance to peek at cosmic phenomena that are normally invisible. By detecting light with very short wavelengths, in the millimeter and submillimeter range, ALMA can spot the clouds of gas and dust where new stars are form, as well as the disks of debris around stare where planets are born. The new ALMA observations of HD 142527 found that the star is surrounded by cosmic dust that could be smashing together to form planets. Especially encouraging is a bright "knot" in on the northern side of this disk — a submillimeter emission that is 30 times stronger than the southern side emission. "We are very surprised at the brightness of the northern side," Misato Fukagawa, an assistant professor at Osaka University, said in a statement. "I have never seen such a bright knot in such a distant position. This strong submillimeter emission can be interpreted as an indication that large amount of material is accumulated in this position. When a sufficient amount of material is accumulated, planets or comets can be formed here." This image by the ALMA radio telescope in Chile shows a giant ring of dust and gas where alien planets may be forming around the star HD142527 about 450 ;light-years from Earth. 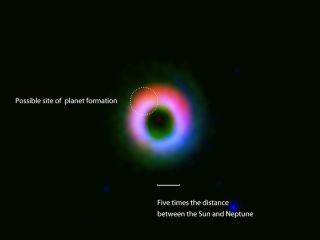 Fukagawa and colleagues believe that if the ring has a ratio of dust to gas (1 to 100) comparable to other solar systems, then giant gas planets several times more massive than Jupiter could be forming in the disk. But if this dense knot in the ring has a higher ratio of dust, it could spawn a "dust trap" that gives rise to Earth-like rocky planets and small bodies like comets. In any case, the solar system HD "offers a rare opportunity for us to directly observe the critical moment of planet formation and can provide new insights into the origin of wide-orbit planetary bodies," the scientists wrote in their paper posted on the preprint service ArXiv.org. The scientists say they hope to get more precise measurements of the amount of gas in the disk to identify what kinds of planets might be forming around the baby star. They also hope ALMA can help them spot even more planet-forming disks around other stars. "HD 142527 is a peculiar object, as far as our limited knowledge goes," Fukagawa added. "Our final goal is to reveal the major physical process which controls the formation of planets. To achieve this goal, it is important to obtain a comprehensive view of the planet formation through observations of many protoplanetary disks."